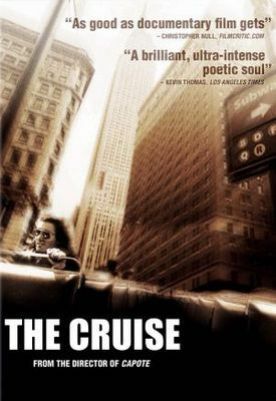 The Cruise, directed by Bennett Miller, is really a one-man show featuring Timothy “Speed” Levitch, a tour guide with the Gray Line Tours in New York, who is a non-stop talker in a distinctively New York fashion, spouting a mixture of pseudo-profundity and nonsense in a vain attempt to show himself off as sage, prophet, poet and scholar. In fact, he is just one more of our seemingly endless supply of crypto-hippies—actors, rock singers, comedians, street poets etc—who manage to make a living in the midst of our booming Clinton economy by glorifying, in one way or another, the more general cultural tendency among single urban males (especially) of refusing to grow up. This kind of sub-mystical nonsense Levitch appears to think of as distinctively artistic or writerly, and his running commentary on the Gray Line tour of Manhattan concentrates on the romance of “writers”—including Poe, Melville, Henry James, H.L. Mencken, Edith Wharton, Nathaniel West, Henry Miller, Arthur Miller, Jack Reed, D.H. Lawrence—among whom he seems to hope to be numbered himself. All of the famous writers, interestingly, are said to have lived some blocks away from where Levitch is actually speaking about them and none of their actual houses appears on film. Bennett Miller appears no more interested in them qua writers than his subject is. For both of them the names are just magic words which confer some of their magic on those who use them. Alas, I fear it is too late.